The Karma Top, by Turn It On Fitness, a new Crossover Fitness Fashion line launched by two Tri-State natives. In last week’s issue of Cincy Chic, we wrote about “Turn It On,” a new women’s clothing line launched by two Tri-State natives. It talked about how a former Ben-Gal Cheerleader and model, Juetta West, and Althea Harper, the runner up on Project Runway Season 6 and designer of her own fashion line teamed up to launch this unique “Crossover” line. It’s designed to take you from the gym to work or play (and everything in between). Me with Juetta at coffee! Juetta reached out to me a few weeks ago saying she’s been a long-time reader of Cincy Chic… even once she moved to Hawaii several years ago! I’ve been following Althea since her pre-Project Runway days, so I was so excited to read the Cincy Chic story about how she and Juetta teamed up to create this great new line. I was even more excited when Juetta said she would be in Cincinnati to do a few trunk shows to launch the line and said she could meet me for coffee! Then, when we met, she came bearing gifts! She wanted me to try out one of their items – the Karma top – to let her know what I thought of it. The top features a loose fit with open draping back and open shoulders. It’s made of 92% Supplex® nylon and 8% spandex with moisture wicking and 4-way stretch (click here to learn about the unique kinds of fabrics they use). This top is $80 on their site, and their other tops start at $80 as well; the skirts at $90; the pants at $105 and the jackets are typically around $140. I love my new Karma Top because I can throw it on with skinny jeans and jewelry and I’m ready to meet my girlfriends for cocktails. A blazer, dress pants and pumps for work. Or workout pants, sports bra and gym shoes for a good workout. 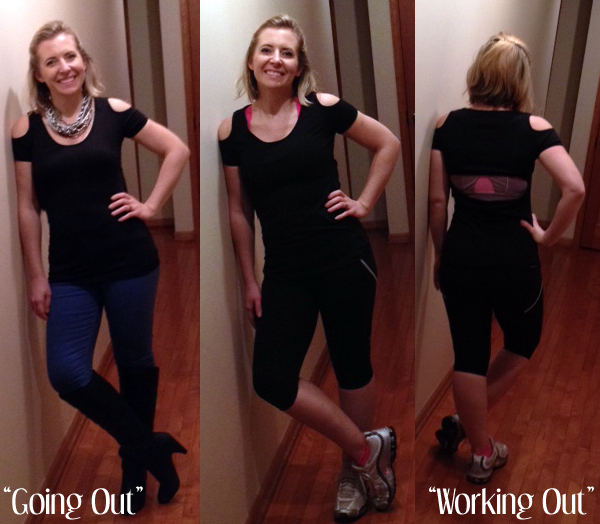 Check out a few ways I’ve worn my new Turn It On Karma Top thus far in the pics below, and click here to check out Turn It On Fitness for yourself! 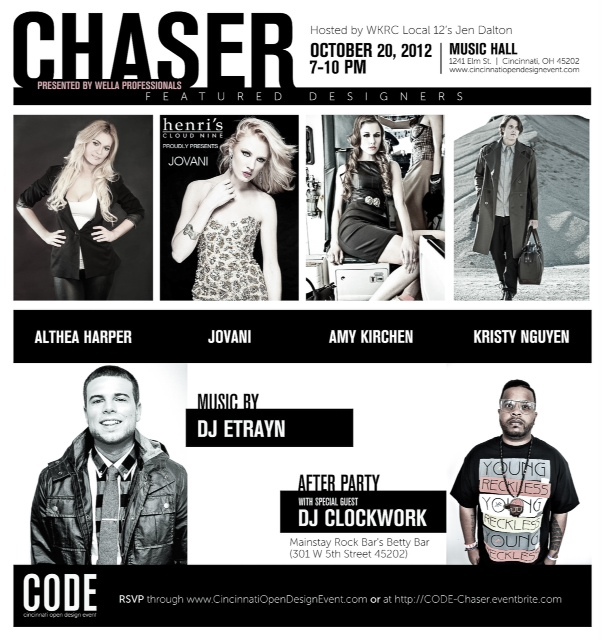 This past Saturday, I had the amazing pleasure of attending the CODE Chaser Finale event at the Music Hall. Not only did I get to attend the event but I was also a VIP! I was so excited to be able to go, I even brought my best friend along! 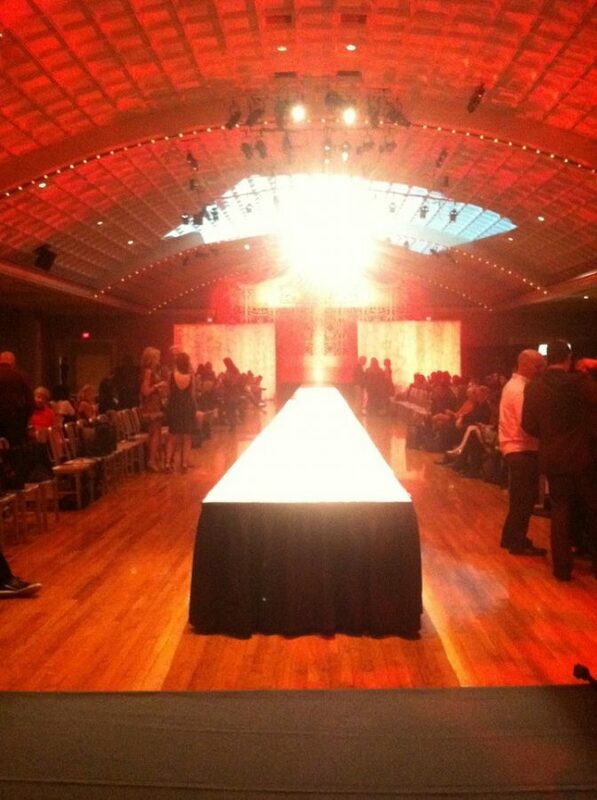 We had a great time checking out the scene and even more fun watching the fashion show. The atmosphere during the night was so engaging. With DJ ETrayn in control of the music, a fun photo booth and a huge crowd! The swag bag with Wella Professionals shampoo, conditioner, styling product and water bottle and the Mitchell’s Salon and Day Spa packet with a trial shampoo and conditioner wasn’t too shabby either. My VIP ticket got me a front row seat to the fashion show that ended the first-ever CODE event series. I’ve never felt more fashionable in my life. Sitting front row and watching models strut by was such a great experience and permitted my obsession of fashion to go into overdrive. Amazing lines like the Amy Kirchen Boutique, Althea Harper, Kristy Nguyen, and Jovani Fashions all debuted their new collections. Amy Kirchen’s Spring 2013 Collection was full of neutral tones and poshly professional pieces. The nature-inspired collection from Althea Harper was chic and nurturing. Jovani Fashions was, of course, as formal and fashionable as ever with sequins galore. And Kristy Nguyen’s men’s line was military inspired and full of army greens. I couldn’t keep my jaw from dropping at these great new releases. Seeing the fun prints, sequins and men’s fashions made me so excited to update my (and my boyfriend’s) wardrobe this spring! After debuting her new line Althea Harper made a fantastic announcement! She will be returning to Project Runway: All-Stars on October 25! As if the crowd hadn’t already seen and heard amazing things, this was definitely icing on the cake! If you want to check out more from the event visit CODE’s Facebook page! CODE Chaser Event This Saturday! This Saturday, October 20, will be the first ever CODE Chaser Event! 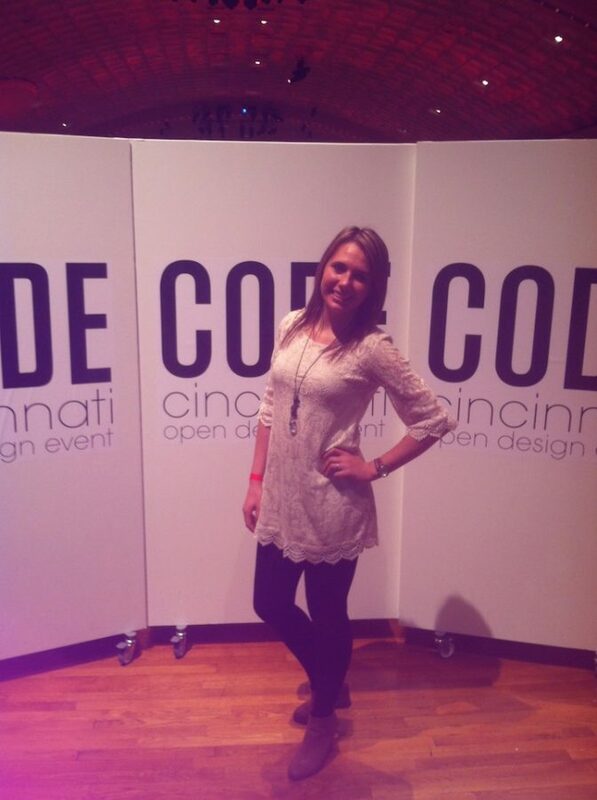 We first wrote about CODE in August here on Cincy Chic…. and now, this Saturday is the big event! The Cincinnati Open Design Event (CODE) will be hosted by WKRC Local 12’s Jen Dalton, from 7-10pm at Music Hall on 1241 Elm St., downtown! One of my favorite designers, Amy Kirchen, will be there as well as Althea Harper (from Season 6 of Project Runway! ), Jovani, and Kristy Nguyen. Music will be by DJ Etrayn and the After Party will have special guest DJ Clockwork. The After Party will be at Mainstay Rock Bar’s Betty Bar- located at 301 W 5th St.
Click here and use the promo code CINCYCHIC for FREE standing room tickets! Thanks to my intern Sara Elliott for helping put those blog post together! I’ve been a huge fan of Althea Harper for several years now. It’s been really neat following this midwest fashion maven from her formative days right out of DAAP and on Project Runway… then as a designer formulating her first collections…getting Hollywood attention… and visiting Tri-State boutiques for trunk shows. If you are a big fan too, I have some good news! She’ll be visiting the area very soon! March 16 from 6-9pm, she’ll be at Sloane Boutique in OTR. See the below release for more details! CINCINNATI (March 8, 2012) – On Friday, March 16 from 6pm to 9pm, Sloane Boutique will be hosting a Trunk Show with Fashion Designer and DAAP Graduate, Althea Harper. Althea Harper will be present with her Spring 2012 Collection as well as her Fall 2011 Collection. Sushi from Fusian Sushi and Gallo Wines will also be provided. Althea Harper is a fashion designer and entrepreneur who manages her own fashion line, ALTHEA HARPER. With a cutting edge style that combines both tailoring and draping to make silhouettes appear strong and beautiful, Althea Harper is one of the breakthrough fashion designers in today’s industry. Her style reflects her experience working alongside numerous renowned designers, including Anna Sui, Zac Posen, Alexander McQueen and Vivienne Westwood. She is also known for her unique work in knitwear. Althea’s designs have won the attention of many people, including passionate Project Runway fans and the entertainment industry’s most respected personalities. Bloggers and fans have affectionately labeled her the “fabulous glamazon” and Tommy Hilfiger called her “genius.” Heidi Klum, Eva Longoria, Kerry Washington, the Kardashians and Angela Simmons are all fans of her designs. Althea attended both University of Cincinnati School of Design, Art, Architecture and Planning and Central Saint Martins in London. Following graduation she became a finalist on Project Runway Season 6. Upon completion of filming Project Runway, Althea moved to New York City where Tory Burch invited her to become a part of the label’s design team. While designing for Tory Burch, she continued to build her own line, self-titled ALTHEA HARPER which has shown consistently in New York fashion week since its debut in September 2009. Althea now currently designs full time for her successful eponymous line.